Another exciting race at the Marrakech E-Prix 2019. Another podium and a first-place finish for Mahindra Racing’s Jerome d’Ambrosio, after a self-inflicted team disaster between the BMW Andretti Motorsport drivers. His teammate Pascal Wehrlein impressed the whole weekend after qualifying 7th. But an early collision with overeager Di Grassi, meant the end for Pascal’s maiden race in Formula E. We are sure to see more of him. Andre Lotterer, DS Techeetah Formula E Team, finished 6th, ramping up points for himself and his team. He now ranks 4ths in his second season. His teammate Jean-Eric Vergne admits to making his “biggest mistake in Formula E.” Yet, he finished strong in 5th position now ranking third in the overall championship. Felipe Massa gets labelled an “amateur” by Brazilian fellow countryman Piquet Junior. Massa had nothing to say, but to refer to the technical problems he experienced. One thing is sure, there is plenty to talk about after the race in a perfect setting of the Saharan sun in Marrakesh. A great race and plenty of action for viewers and fans. The Gen2 cars prove to make an impact according to Fia Formula E. Here’s a direct comparison with last season’s Gen1. Susie Wolff, Team Principal of Venturi’s Formula E squad, treated her husband and Mercedes Formula One boss Toto Wolff to a day out at the Marrakesh E-Prix for his 47th birthday. Watching all the action alongside Formula E Founder and Chairman Alejandro Agag, the German team boss cracked a smile when he saw his Formula 1 title flash up on screen. Mercedes won both the drivers and construction championchip. Sometimes emotions run wild on the race track. This time it struck DS Techeetah’s Jean-Eric Vergne and he had to pay the price. Seconds into the race, on the very first corner, the Frenchman stuck his nose on the inside of Envision Virgin Racing’s Sam Bird before backing out and spinning, sending shockwaves through the pack. The reigning champion and self-confessed “idiot” later admitted it was his “biggest mistake in Formula E” but he wasn’t sorry for trying. For the second year running, Audi Sport Abt Schaeffler rookie driver Nico Mueller smashed the lap record in Marrakesh, posting a 1:17.074s lap during the second in-season test after the race. “I’m happy to have ticked most boxes, learned a lot, and I think we’re now better prepared for what’s to come and to finish the day top of the times is obviously nice,” said the Swiss driver. 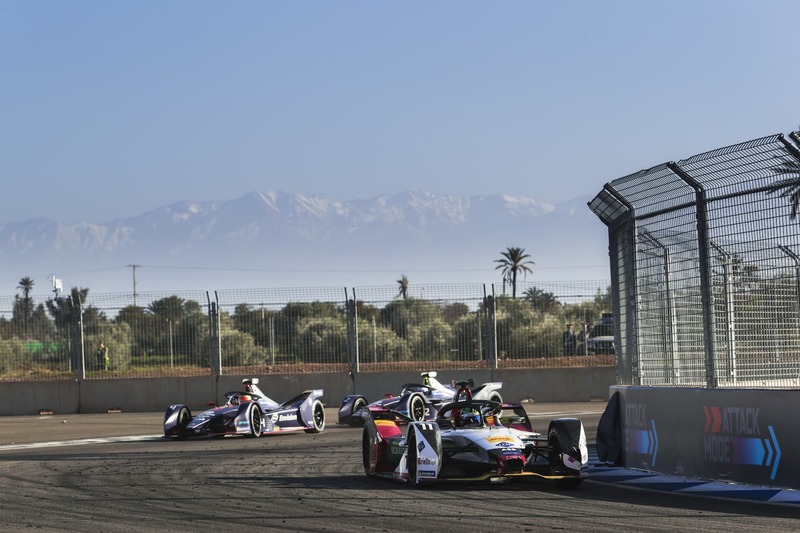 The 2018 Marrakesh E-Prix marked the first race after the technology company ABB became a main sponsor of the Formula E season, now to be named FIA Formula E Championship. It proves that Formula E has become an attractive platform for many businesses that aim to position themselves for innovation and technological progress. This innovative racing series has seen some phenomenal growth. It receives support from important influencers such as Nico Rosberg and the automobile industry. We are all excited to see where Formula E will be heading in years to come.